I have fond memories of watching Godzilla vs. the Smog Monster from when I was a teenager–and, oddly enough, it’s still enjoyable in the same vein as it was then–an odd combination of cheesy movie and environmental doomsday. It’s an odd movie and a cult classic. The basic story has a mysterious creature being found, causing damage to people–this small creature is toxic, feeding on Earth’s pollution, and excreting poisonous gas. The small creatures merge together to form a large, Godzilla-sized monster, known as Hedorah. The Smog Monster (as Hedorah was known in its’ American release) causes massive damage across Japan, including a scene where a young boy comes across the human skeletal remains of its’ victims. Godzilla handily defeats Hedorah in their first encounter, but Hedorah then displays its’ ability to change its’ shape to a flying-saucer form, where it is able to defeat Godzilla. In a last-ditch effort, the Japanese military follows the direction of a scientist, and build a giant pair of metal plates to project electrical arcs between them, and dry out the sludge-based Hedorah. The equipment fails at a critical moment, but Godzilla using his atomic breath to power the equipment and destroy the pollution-based monster. 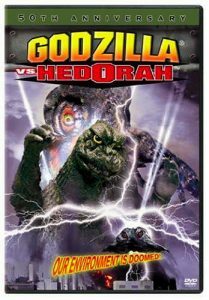 Godzilla vs. Hedorah is a cheesy movie, with an odd mixture of social comment and men fighting in rubber suits. But it’s one of the better Godzilla movies of the period–and contains the comical scene of Godzilla pursuing the fleeing Hedorah by tucking his tail beneath himself and firing his atomic breath at the ground, flying like a rocket. I rate Godzilla vs. Hedorah 3 stars out of 5. Yukio Keuchi: Oh, you like Godzilla? Ken Yano: Superman beats them all! Ken Yano: Sure, it’s a falling star that falls to earth. Dr. Yano: It probably came from a sticky, dark planet far, far away. Now go to sleep. Dr. Yano: In each creature, there’s a weakness. Ken Yano: Hedorah’s only sludge … he can be dried. Yukio Keuchi: There’s no place else to go and pretty soon we’ll all be dead, so forget it! Enjoy yourself! Let’s sing and dance while we can! Come on, blow your mind! [Godzilla and Hedorah battle it out on top of Mount Fuji]Ken Yano: Get’em Godzilla! A sequel, set in Africa, was planned. However, G-series producer Tomoyuki Tanaka, who had been hospitalized during the film’s production, was enraged by the film once he saw it, telling director Yoshimitsu Banno that he had ruined the Godzilla series. Tanaka immediately ordered the filming of a more conventional Godzilla movie (Godzilla vs. Gigan (1972)). Thus, the “Smog” sequel was never made. This is the first film in the series since Mothra vs. Godzilla (1964) to have a strong social message attached to it. This is the only movie in which Godzilla demonstrates his ability to fly by firing his atomic breath towards the ground and propelling himself backward. When Godzilla chases down Hedorah near the end of the film, the director originally shot two different scenes. One had Godzilla chasing Hedorah on foot, the other had Godzilla flying after him. The flying scene was the one used in the final cut of the film because the director thought a comical scene was needed to lighten up an otherwise dark film. This was the last Godzilla film to be released by American International Pictures (AIP) and dubbed by Titra Productions. The remaining Godzilla films from this decade were released by Downtown Distribution and/or Cinema Shares, and simply used edited versions of Toho’s international English prints. This was the first film that featured Kenpachiro Satsuma to wear the Smog Monster suit. Though small in stature, Satsuma was quite strong for his size and was the only one capable of supporting the 300-pound suit for long periods of time. (Though there were some wire works to help support.) Satsuma then went on to wear the Gigan costume for the next two films. After a break of over 10 years, he would be asked to wear the Godzilla costume for Godzilla 1985 and would continue to wear it through the Heisei series, and retired after Godzilla vs. Destroyah in 1995. In the scene where a piece of Hedora comes down the stairs of the club during Godzilla and Hedora’s first battle, there is a picture of Martin Luther King hanging on the wall behind it. One of the films included in “The Fifty Worst Films of All Time (and how they got that way)” by Harry Medved and Randy Lowell.